Higdon has been invited to serve as a Distinguished Guest Composer at the Intimacy of Creativity – The Bright Sheng Partnership: Composers Meet Performers in Hong Kong (IC) 2019. Intimacy of Creativity explores the creative process through public, in-depth open discussions on the campus of the Hong Kong University of Science and Technology (HKUST), which presents the festival. Awarded by Northwestern University, Higdon has been named the recipient of the 2018 Nemmers Prize in Music Composition. This prestigious award is given to contemporary classical composers of exceptional achievement "who have significantly influenced the field of composition". In addition to a cash award, the prize includes a performance by the Chicago Symphony Orchestra. 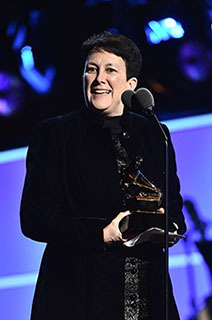 Higdon will also visit Northwestern University and lead coaching sessions with school ensembles, conduct lessons and seminars, and participate in an interdisciplinary panel discussion on LGBTQI in the arts. Higdon was commissioned by the Chicago Symphony Orchestra, Philadelphia Orchestra and Baltimore Symphony Orchestra to write a work for low brass and orchestra. The Chicago Symphony Orchestra, under the direction of Maestro Riccardo Muti, premiered the work in February, 2018. Higdon was commissioned to write a harp concerto for Yolanda Kondonassis which was premiered by the Rochester Philharmonic Orchestra in May of 2018. Maestro Ward Stare opened the RPO's '18-'19 season with Higdon's Harp Concerto and it was recorded at that time by Kondonassis and the Rochester Philharmonic Orchestra for the Azica label. Other co-commissioners performing the work this season include the Baton Rouge Symphony, Fargo-Moorhead Symphony, the Lansing Symphony Orchestra and the Oklahoma City Philharmonic. Lawdon Press is happy to announce that Cold Mountain will receive its West Coast premiere this summer at the Music Academy of the West. This exciting new production is created exclusively for the Academy and will be directed by James Darrah and conducted by Daniela Candillari. Performances will occur on August 2 & 4, and Higdon will be present. Under the baton of Stephane Deneve, the Cleveland Orchestra will perform Higdon's most personal work which has become part of the orchestral repertoire. Lawdon Press is pleased to announce the world premiere recording of Notes of Gratitude. 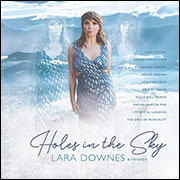 This recording of Lara Downes, pianist, features a collection of music written by and performed by an amazing group of today's female leading artists. This recording is available on amazon.com. Lawdon Press is pleased to announce the world premiere recording of Dance Card. 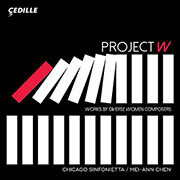 This recording is performed by the Chicago Sinfonietta, under the baton of Mei-Ann Chen, Higdon is honored to be a part of this CD which includes a collection of newly commissioned American works. This recording is available on cedillerecords.org and amazon.com. This website and all content copyright 2009-2019 Jennifer Higdon, Inc. Site Design: Canfield Design Studios, Inc.